The MTA is generally bad, so much so that some guys tried to give it an award for being the worst at one of the L train shutdown town halls last week. Speaking of which, the L train shutdown? Seems bleak! Good thing I don’t have a regular commute, because I am too scared to bike anywhere. If you’ve been particularly frustrated about the MTA lately, come be among folks who feel similarly at a comedy show all about the history of this transit system, starting with the origins of the MTA in the 1830s. Let’s just hope your train doesn’t get too delayed on the way there. Who am I kidding? It probably will be. Being mad can be stifling, but it can also lead to some creative breakthroughs. If you ask the vibrant crew of performers that comprise the Beef Show (aka the BeefSquad), anger is a constant presence that ebbs and flows. They’re always mad, but sometimes they’re not as mad. 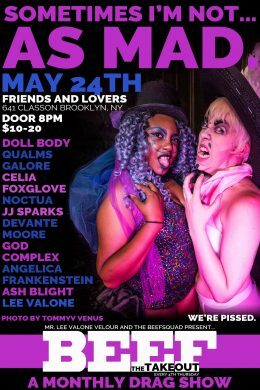 The first edition of Beef’s new monthly show may give you a peek at some of those moments, brought to you by Beef Show’s array of queer and gender non-conforming drag and burlesque artists helmed by Mr Lee. VaLone Velour, who was recently crowned the illustrious title of Mr. Coney Island. Honestly, reading the description of this new play by Relentless Award finalist Liza Birkenmeier sort of makes it sound like something Stefon from SNL would talk about when discussing a piece of theater. It has everything: podcasters, witchcraft, claymation filmmaking, a half-pig half-man, explorations of colonialism… If you’re overwhelmed by all those things, another description of the play offers that it “tackles the perils of having a body in a repressed, imperialist, and moralistic world,” and if that’s not relatable, I don’t know what is. Some cooking shows are helmed by people with true culinary expertise, but others are hosted by guys like Josh and Ethan, whose respective experience is comprised of one home economics class and a brief stint as a casting editor for Chopped. Despite this, they will still be going in front of an audience and teaching them how to cook a food. 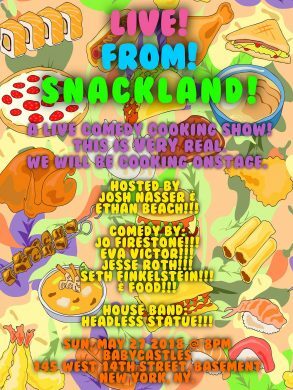 They will be joined by comedians Jo Firestone (serving as celebrity guest judge), Eva Victor, Jesse Roth, Seth Finkelstein, and everyone’s favorite jokester: food itself. I for one finally finished watching all the episodes of The Great British Baking Show the other day, so I’m just going to imagine that this show is a lot like that, except instead of Paul and Mary talking about how the layers are there and the flavors are coming through and the cake with bourbon is way too alcoholic, it’s Jo Firestone doing all of those things.